Hours: Daily, 11:30 a.m. to 11 p.m. This new ramen place opened up on Geary Boulevard about two months ago and the folks on the Chowhound board have been raving about it. I love ramen, the Japanese soup noodles playfully highlighted in the Japanese movie Tampopo. (It’s a lot like saimin that I ate growing up in Hawaii but with better broth.) But traveling all the way to the Richmond from the East Bay seemed a long way to go for a bowl of noodles. Luckily for me (in a warped way, I guess), my acne started taking over my life recently and my dermatologist is located on Geary Boulevard, just two blocks from Genki Ramen. So Genki has become my post-acne visit treat. 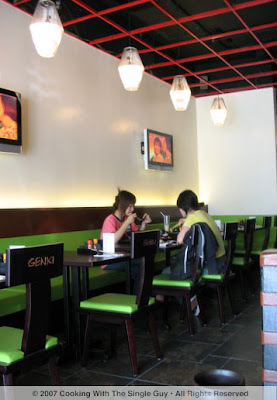 When you walk into Genki Ramen’s tiny restaurant, you feel like you’re in some bad scene from Lost In Translation. Flat screen TVs are mounted around the wall blaring Japanese videos, mostly of young girls singing. When I first visited, I found it charming when they showed some TV show about ramen. But on a second visit, I could barely take the screeching teen-age sounds of this Japanese pop singer on a video that seemed like she was in a bubble gum factory that exploded. So that’s the ambiance. Beyond the audio-visual, the rest of the furnishings are sleek and modern, with a lot of dark wood. But really, I’m just here for the ramen. 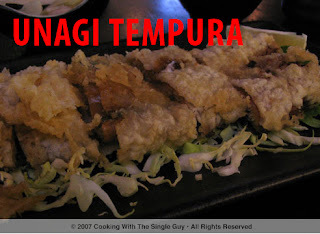 My unagi tempura was fresh and hot, but the batter didn’t seem to stay on to the unagi. Must be that delicious unique unagi barbeque sauce playing havoc on the tempura batter. While the unagi was tender and delicious, I just didn’t get the tempura batter surrounding it and it didn’t enhance the eating experience. Then came my ramen with the crab legs on one side. Remember how I thought the photo was all lovely with the redness of the cooked crab legs? Well, my crab legs were covered in tempura batter so all I saw were these golden puffed fingers instead of red crab legs. What they basically did was deep-fry the crab legs in tempura batter. OK, I know those of you who love tempura probably thinks this is a good idea, just like shrimp tempura. Problem is, with shrimp tempura you can bite right into the batter and eat the shrimp. 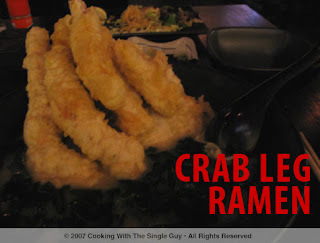 With this crab leg tempura at Genki Ramen, you bit into the tempura and got crab legs with the shell still on! That’s way too much crack for my crunch. The crab legs weren’t all shell; it was cut in half before it was fried in tempura batter. But still, you couldn’t enjoy the tempura batter because you had to break away the shell to get to the crab meat. As I worked my way through the hot batter and equally hot crab legs, I kept thinking to myself, “Why would anyone think tempura crab shells would be fun to cover in batter?” It was so much work that I nearly drowned myself in the bowl of ramen afterwards. But after several minutes of being the sous chef at my table, I was able to get a nice mound of crab meat that I ate with the ramen. Now the ramen. It was great. Firm but soft, filling and enjoyable. The broth was tasty and warm, filling my stomach with comfort and joy. It made up for the morsels of crab I sweated to get out. Determined to get a real ramen experience, I came back a few weeks later with my nephew. We ordered a gyoza to start and he ordered the Chicken Karaaga Ramen. I should have stuck with something simple but got enticed again by the Spicy Mabo Tofu Ramen. 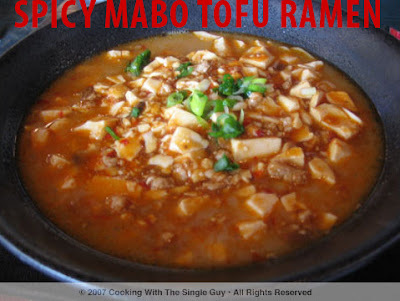 I'd never had Mabo Tofu Ramen (although I love Mabo Tofu and make it often for myself at home) but my nephew says it's pretty common in Hawaii now. So I ordered it. At least it's not deep fried. The gyoza was nice and tasty with a nice crunchiness on one side. (It was a bit too shiny from residual oil, however, even though you don't feel the greasiness. You do see it.) 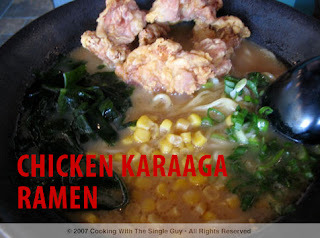 My nephew said he enjoyed his Chicken Karaaga Ramen (kids love the fried chicken) but he thought the broth was on the bland side. I, however, loved my broth. My bowl came out in this wonderful layer of soft tofu and juicy meat. It was definitely a dish you had to eat with your spoon to uncover the ramen underneath, which had the same firm but soft consistency from before. Without having to work this time for my meal, I totally was enraptured by the tofu, ramen and broth. 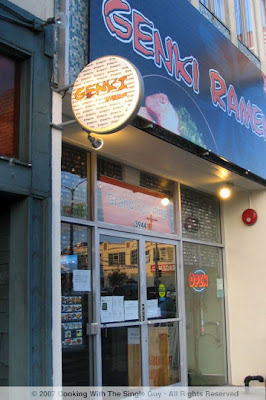 At its core, Genki Ramen offers excellent ramen noodles in a young environment. I have reservations about its deep-frying techniques, but everything else is satisfying and worth the trip to Geary Boulevard. In saucepan, boil water and then add fettucine, cooking it till it's al dente. Set aside. In a large skillet, warm olive oil over medium high heat. Add garlic and shallot and saute for about a minute. Add mushroom and sweat the mushrooms with a sprinkling of salt for a minute to extract some of the moisture, then add artichoke slices (thinly slice the artichoke heart with a mandoline or something similar, see demo). Add chicken broth and season a bit more with a pinch of salt and squeeze of lemon juice. Saute for about a couple of minutes to let the artichoke get tender. Remove from heat and add heavy cream. Then add pasta and blend. 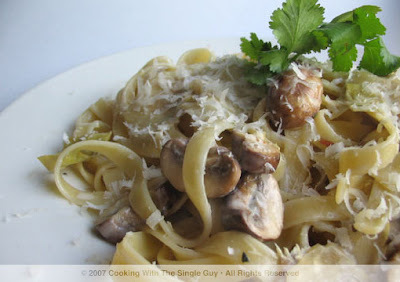 Plate your pasta and garnish with Italian parsley. Serve with a glass of crisp Pinot Grigio. TIP: When adding citrus to dairy products, you run the risk of curdling the dairy into cheese with the citrus. So to avoid that, make sure you combine the citrus and dairy in low heat. In the recipe above, I suggest you add the heavy cream off the heat to avoid curdling with residual lemon juice. EXTRA OIL: To touch up your pasta dish, you can also drizzle nice extra virgin olive oil over your pasta. This step is especially helpful with leftovers that you're warming up the next day. A friend of mines tried my carrot ginger soup recipe awhile back. She was all excited by the picture I posted of my version using French carrots I’d gotten at the farmers market. She tried to be nice when she told me that it turned out OK. I quizzed her about how she prepared it, trying to see whether I needed to tweak my recipe. She used regular carrots (which is fine, but I’ve come to realize that French carrots do make a difference—they’re more intense in taste) and she used chicken bouillon cubes to make her broth. I suspect that it might be that her broth base wasn’t enough to boost the flavor of the soup, but what I really suspected was that she needed a bit more salt. When I asked her how she added salt to her soup, she said she sprinkled some from her salt shaker. I told her that I didn’t think she could get much salt into her pot of soup from a shaker, which is really designed for adding salt at the table. But I’ve found that many people are used to adding salt from their shaker. Sure, you don’t want to go crazy adding salt (especially if you have high blood pressure), but I believe salt is the flavor of life (Phoebe said that once on “Friends”) and you need a good amount to salt things like a pot of soup, bland mashed potatoes, or when roasting beef. I love salt. I’m a very savory person. (When I was growing up, I used to love everything sour like vinagrettes.) And I recently checked to see how many types of salt I had in my pantry. Turns out I have seven different varieties. (Note to self: Remember to keep salt out in the open so I remember to use them.) I think salt can be very beautiful too, so I think that’s why I bought so many. The salt I use in my cooking are often natural sea salt because the coarseness feels nice when I grab the grains to toss them into my recipes. Also, natural sea salt doesn’t contain additives and is less processed (or is unprocessed) than Morton salt. 2) Fleur de Sel—Considered the Diamond standard of sea salt, this French sea salt means “flower of salt” and the particular version I have is from the Island of Re. I love its flakiness and I use it for roasting, like when I roast vegetables with Herbs de Provence and olive oil. 3) Murray River Pink Flake Salt—This might be obvious, but I thought this salt was so beautiful when I saw it at Dean & Deluca a few years back. It’s from Australia and has this light pink color. The variety at Dean & Deluca is more pink than what I’ve seen at other stores. It’s used primarily as a finishing salt added at the end of a dish or at the table. So pretty! 4) Kosher salt—This is my main everyday salt. It’s a little coarser than regular Morton salt and does not contain any additives. Kosher salt doesn’t get its name because it’s Kosher (virtually all salt is Kosher) but because it’s the type of salt often used to make things Kosher such as curing meats. 5) Lavender Sea Salt—OK, you guys who read this blog regularly should know by now that I love lavender, so of course I have to have lavender sea salt in my kitchen. The one I have on hand is from The Girl & The Fig and lavender salt is best used at the table side to accent a nice pork or lamb dish. 6) Alaea Sea Salt—Another salt from Hawaii, this one gained popularity over the last few years and has this beautiful color it gets from red clay, where the salt is dried and scraped off of. Because of the red clay influence, it’s a bit more earthy in taste. I gave it to a friend once in a bottle and she thought it was candy! 7) Sel Marin “Grey Salt”—This is naturally harvested unprocessed sea salt from Brittany, France. It’s a step below Fleur de Sel but is just as flavorful. 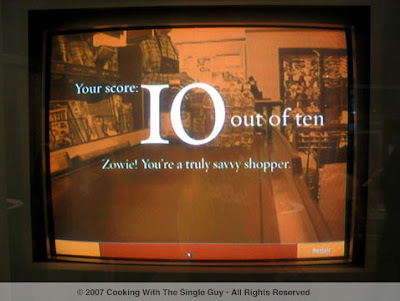 Disclaimer: No employees (yeah, like there really are) or family members of Cooking With The Single Guy may enter. All entrants must be over 18 years old and reside in the United States. Mailing of prizes will occur within 15 days of the announcement of the winner. Cooking With The Single Guy is not liable for damage of prize that may occur in transit (namely the postal service). All products and products name mentioned in this contest should not be considered a recommendation or endorsement but simply a recitation of what’s in the kitchen of the Single Guy Chef. 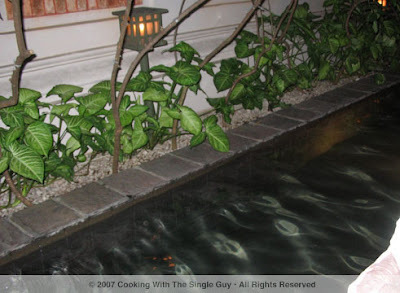 Rules are clearly stated above and Cooking With The Single Guy is not liable for people who can’t read properly or have difficulty comprehending or even knowing what the word comprehend means. Business Lunch: Who Put The Unagi in the Microwave? Here's another easy lunch idea that I sometimes do. It's quick and makes me feel like I'm at a sushi bar. When I go to get sushi, I often order unagi, or broiled eel. I think it's the unique barbeque sauce they slather onto the eel that makes it so yummy. 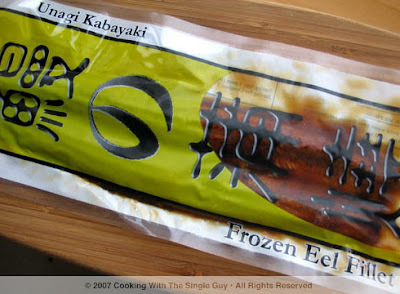 And the eel is often cooked so a lot of people who are shy of raw fish often start with unagi (after graduating from the California roll). Rice is the base: Start by cooking a cup or so of sushi-grade rice. 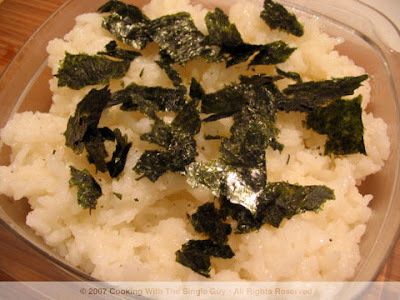 (Sushi rice is shorter grain, similar to arborio rice for risotto. So it's a bit stickier when cooked, but not the same as sticky rice.) Cook as much rice as you want. For me, I typically make two days' worth of this lunch so I don't have to prep more than once. 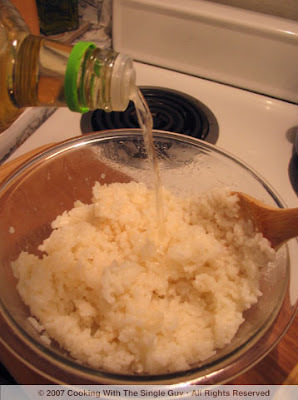 Seasoning the rice: When the rice is done, season it with rice vinegar. There are several varieties, so buy the one that says it's for sushi on the label. But if you just have regular rice vinegar, that's fine too. Like salt, drizzle a little in, mix the rice and taste. Then add to your taste. 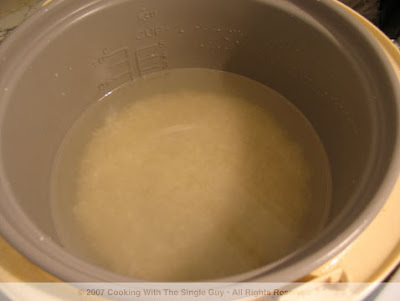 (Keep in mind that as the rice cools, the vinegar taste will get absorbed by the rice and is more subtle.) Make sure you do this when the rice is warm so it'll absorb the rice vinegar. Dress it up: After I scoop the rice into my lunch container, I rip some nori or dried seaweed on top just to give it another flavor level. I always keep a packet of nori in my refrigerator just for these purposes. Now for the star: Get your unagi from the freezer and then cut it into a smaller piece to fit nicely into your container. Now, the following is optional. You can simply put the unagi into your container and then you're all done. The unagi is basically cooked already, so that's why it's not necessary to cook it. And when you reheat your lunch in the microwave, it'll cook the unagi some more. 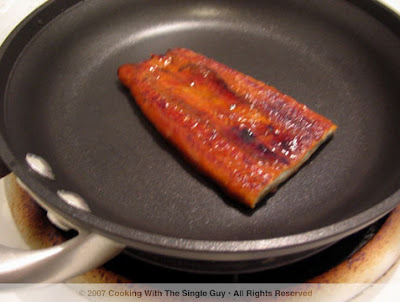 However, if you feel the need to cook your unagi, you can warm it up quickly on a non-stick pan. But you only need to do it for a minute. 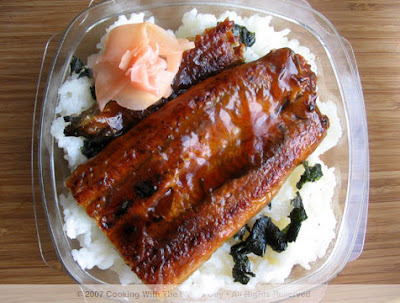 Ready for lunch: Garnish your unagi rice with some pickled ginger (yes, I always keep a container in my refrigerator as well) and then you're all set to go. Like I mentioned, you can reheat it in the microwave for about 3 minutes or you can also eat it cold since the unagi is pre-cooked. Either way, it's a nice lunch with little hassles. 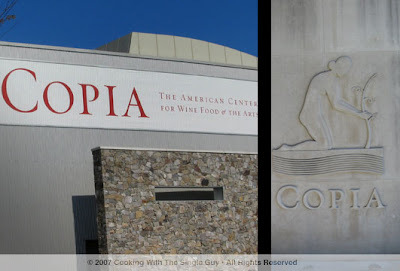 During my recent day trip to Napa, I finally made a stop to Copia: The American Center for Wine Food and The Arts. I have to admit, I subconsciously avoided this massive homage to wine because it was backed and funded by Robert Mondavi, who I always consider more flash than substance. So despite the center opening in 2001, it took me nearly six years to finally step foot in it. This statue was at the entrance. Any guess who it is? 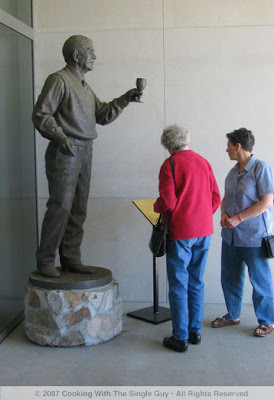 Yeah, I thought it would be Robert Mondavi as well, but it's actually Andre Tchelistecheff, who's touted as the "father of California winemaking." Apparently this Russian immigrant traveled many years ago to Napa before Napa was Napa and worked for Beaulieu Vineyards. Like I said, the architecture of Copia is beautiful, very sweeping. 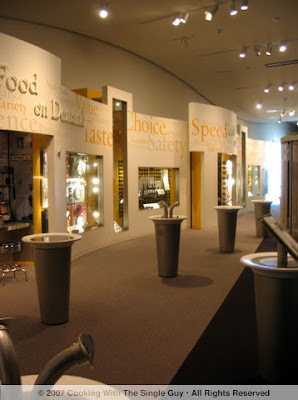 Near this foyer they do have a wine tasting station, serving up free glasses for guests. They were serving Spanish wines on the day I visited. 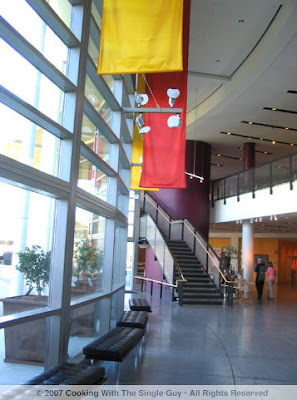 On the second floor is a main exhibition area. 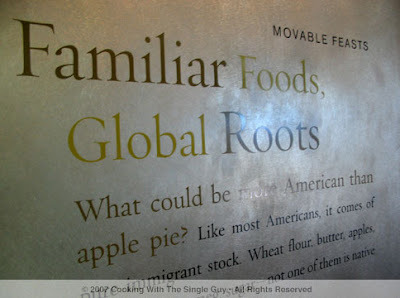 I like how they focused on world food issues. More scenes from the exhibition area. It was a quiet day. 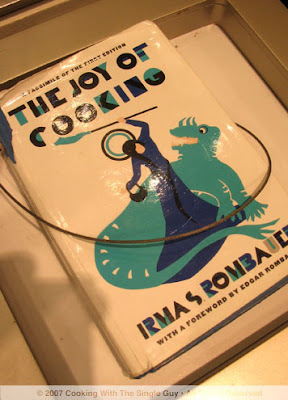 The bible of cooking: An original copy of "The Joy of Cooking." 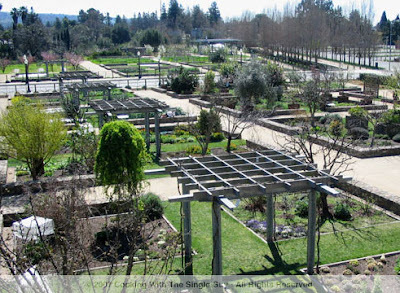 One of the more interesting things at Copia is the garden with a variety of herbs and fruit trees. It's great to stroll on a beautiful day like the day we had. 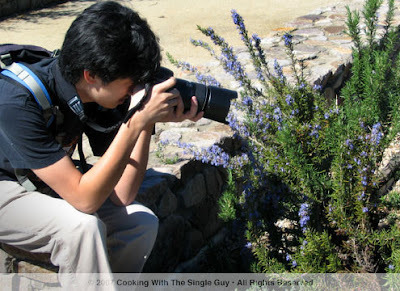 My nephew taking pictures of some blooming rosemary. He loves taking picture with his digital camera, and does a pretty nice job at it too. 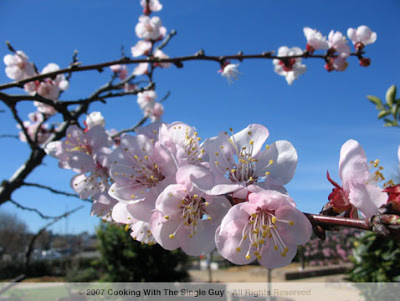 Apricot blossoms were in full bloom when we visited. 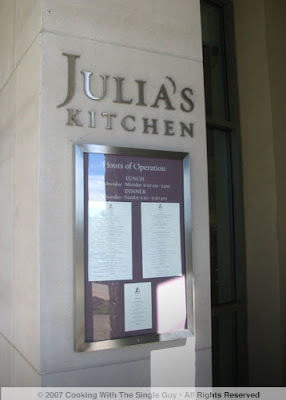 The restaurant at Copia is called Julia's Kitchen in honor of Julia Childs of course. I can't say what the food is like because we didn't eat lunch there, but it looked interesting. Several people liked eating outdoors at Julia's Kitchen. The bar leading up to Julia's Kitchen. There's always shopping to do. 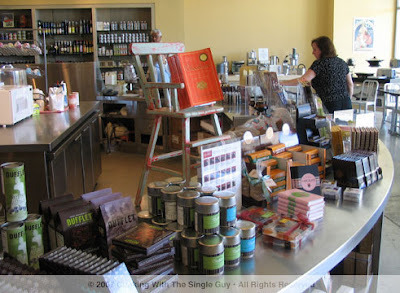 Along with the gift store, there's also a food cafe selling food products. This product is from a South African company called So!Go! (Short for So Gourmet) It combines five spices that includes the signature tastes of star anise and cloves. After I bought it, I was inspired to make this very simple, clean grilled chicken dish. I've seen a lot of people make Chinese 5-spice chicken with soy sauce and other ingredients that cover up the 5-spice flavoring. This recipe showcases the spice (which can be a bit peppery) and I've dressed it up with a side of sauteed fennel. So!Gourmet! Chinese 5-Spice grinder. $12 at Williams-Sonoma stores. Prepare your chicken breast by flattening with a pounder (covering your chicken breast with plastic wrap) to make it evenly thin, about 1/2-inch thick. Season both sides with salt and Chinese 5-spice. Then drizzle with olive oil to coat. Warm a grill skillet or outdoor grill, and cook chicken on both sides (about 6 minutes each side). When your chicken is almost done, squeeze orange juice over chicken and remove from heat. Let the chicken rest. In a saute pan, warm olive oil over medium high heat. Add fennel that you've thinly sliced (using a mandoline slicing only the bulb part, leaving the stalk for garnish) and add salt and orange juice. Saute until soften, about 10-15 minutes. 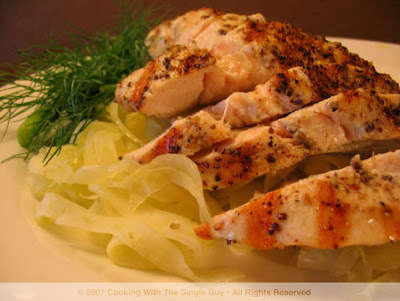 Place your fennel on a plate and lay your cut chicken breast on top. Garnish with some of the fennel leaves. Makes 2 servings. Serve with roasted garlic mashed potatoes. 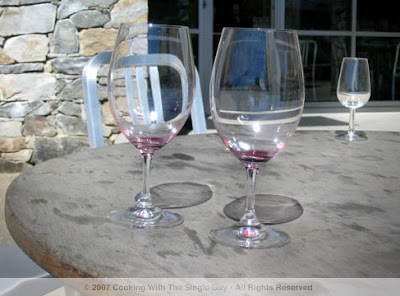 Serve with a glass of Chardonnay. TIP: I love using fennel, which is sometimes called "sweet anise" at the grocery store. Cut off the top stalks. Then cut the bottom part off to make a flat surface so you can begin cutting thin slices using a mandoline or something similar. Put the stalk into a vase and add some flowers to create an interesting centerpiece for the table. WHAT'S IN YOUR FIVE? 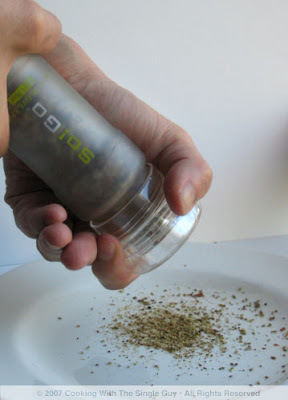 If you don't have Chinese 5-spice readily mixed, then create your own by placing black pepper (preferably Szechuan peppercorns), cassia, cloves, fennel seed and star anise into a spice grinder. THIN IS IN: Why do I emphasize thinly sliced chicken breast? Because I find them faster to cook on the grill without burning but still getting that nice grill marks. And I like them even so they cook evenly and I don't have to worry about one part being undercooked while the other side is burnt. I mention above how you should pound the breast thin, but some grocery stores (such as my local Safeway) now sell thinly sliced chicken breast steaks. Perfect! Where do you keep your nori sheets for your sushi? Well, I actually keep it in my refrigerator instead of just in the pantry. 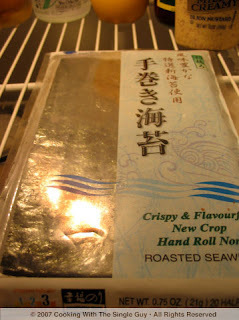 Nori is the essential Japanese seaweed used to make sushi. I always have a packet in my refrigerator. The cold keeps it crisp and dry, which is good for nori. I also keep it in a plastic baggy as an extra protection, but this particular brand I have now (right) comes with its own air-tight opening. I can keep them in my frig for months! This nori I have is actually a smaller version of the typical squares used for sushi rolls. This one is used mostly for hand rolls but I like to have them ready to make musubi, which are the rice balls the working class made as an easy lunch. I make them sometimes (using a musubi mold) for a snack. I'll do a demo one day. I'm mentioning the nori because I'm going to use it next week for a recipe. So stay tuned. Mon.–Fri., 11 a.m.–11 p.m., Sat., 5–11 p.m.
With the weather getting warmer in the Bay Area, it’s always nice to find a good dinner with outdoor seating. I often forget about the charming scene at Belden Place, that tiny alley between Chinatown and the Financial District. I think it skips my mind because I often end up going to Belden Place when I have an out-of-town guest and want to act like I know a secret dining spot where people gather to eat on the street like some Italian neighborhood festival. Of course, it’s not a big secret. 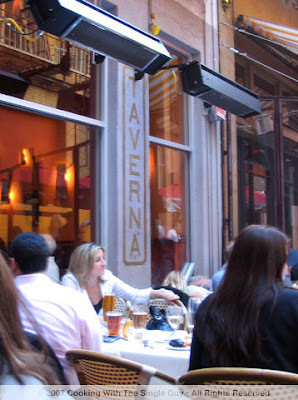 But maybe the restaurant Belden Taverna remains the secret. The youngest member on the street that boasts such stars as B44, Café Tiramisu and Plouf, this sophisticated Mediterranean restaurant (it took over the spot that was once Café 52) doesn’t seem to be getting the same buzz despite its glamorous interiors and well-executed dishes. I found myself on Belden Place when my nephew was visiting recently on his college spring break. 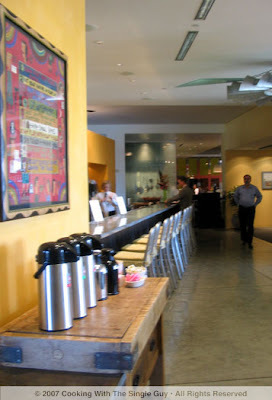 We strolled passed the boisterous tables of each restaurant in the alley, eyeing their menus and checking out the scene. (I tried to edge my nephew toward B44, but he didn’t look like he was in the mood for tapas.) Despite the fact that the restaurants at Belden Place continue to draw both tourists and after-work business types, the hostesses at each establishment still feel the need to entice you to select their spot, like it’s some kind of beauty pageant and the winner gets dinner with Miss U.S.A.
We eventually settled on Belden Taverna because it was the most California of the bunch. (We had Italian the night before, and like I said, my nephew didn’t look like he was hungry for Spanish.) 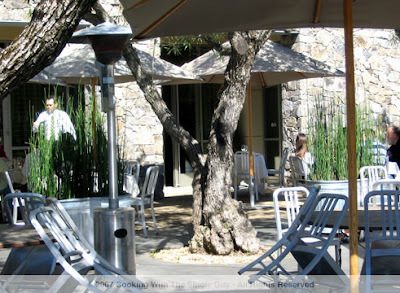 Sitting outside under the setting afternoon sun is a perfect way to start a meal, even though you have very little privacy with the tables set up like communal tables. 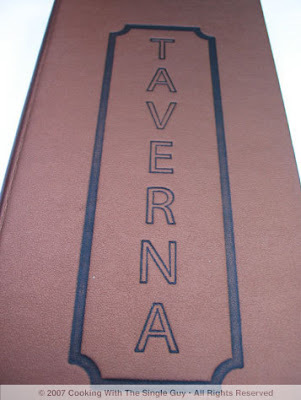 Belden Taverna calls itself a Mediterranean restaurant, but I felt like it was more an Italian-California restaurant when looking over the selection. The restaurant’s chef, Adam Hrebiniak, is quietly developing an appealing menu based on his experience working at such places as Zax Tavern in Berkeley and Boulevard in San Francisco. I got the Sauvignon Blanc to pair with my starter, the Grilled Pear Salad with Prosciutto and Arugula. I loved the taste of the prosciutto married with a light vinaigrette. It was refreshing and filling, even though the pear slices were a tad too grilled. 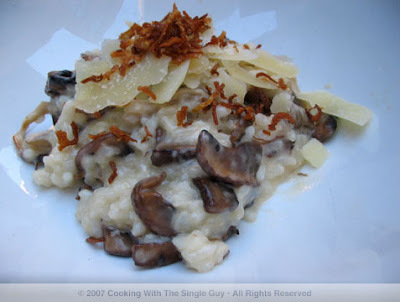 My nephew had the wild mushroom risotto appetizer. How anyone would offer a rich dish like risotto as an appetizer, I’ll never understand. But all was forgiven when I tasted it. The risotto was warm, like it came straight from the pot to our table. It was pure Italian comfort food, with a distinctive broth taste and nice crispy garnish on top. For our entrees, I had the fettuccini with crab (because I didn’t get to eat as much crab this season as I’d hope) and my nephew had the spicy Italian sausage penne. 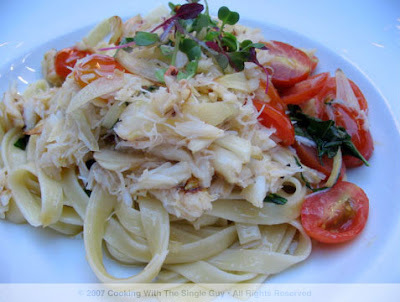 My fettuccini was a light dish, dressed simply with olive oil and fresh basil and cherry tomatoes. While there was a lot of crab to make me happy, the taste wasn’t as tantalizing as our starters. 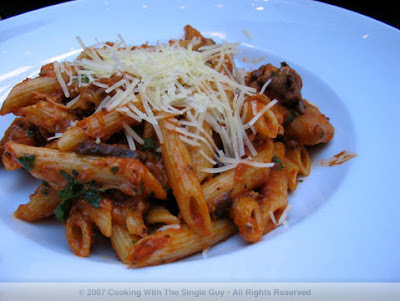 My nephew’s sausage penne definitely had more flavor, with a mild spicy flavor blended with the rich tomato sauce. I found the penne enjoyable but my nephew thought the pasta could have been cooked longer. I admonished him because he’s used to baked pasta that’s totally soft, but I told him that his penne was perfectly al dente, which is how it should be. 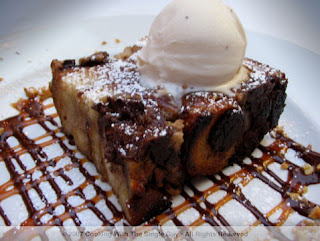 For dessert, we shared a banana bread pudding. When it came out, I was confused that maybe we had ordered some kind of chocolate cake because it really resembled that. My nephew loves bread pudding, but I’m not a big fan so I wasn’t all that thrilled about dessert. My nephew felt it needed more vanilla and less chocolate sauce. Despite the lackluster ending to our meal, I felt the overall experience was extremely pleasant and satisfying. 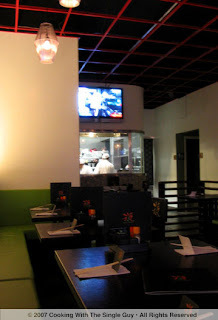 The dishes seemed fresh and well-executed and the service was well paced and friendly. And the advantage of eating outside on a beautiful San Francisco spring night is unmatched. During this season of lent, Fridays can be a challenge trying to think of dishes to avoid eating meat. Most people go with fish (and yes, I do love a good salmon), but after awhile you might crave for something different. Tofu makes a nice alternative. I especially like to make stir-fry tofu because it's quick and easy (the theme of this blog, who knew! 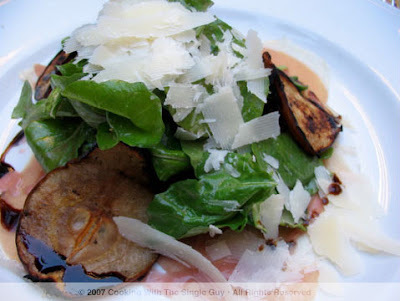 ), and for that I generally look for fried tofu at the grocery store. 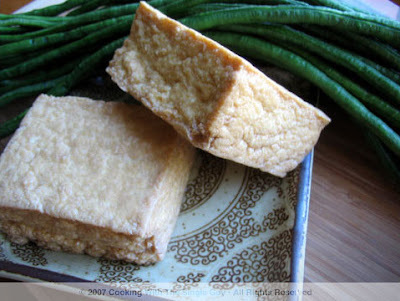 Fried tofu is different than regular tofu that's firm. It actually has a brown skin around the exterior because it's been deep-fried and then packaged. So it's ready to eat. The version I found at my local grocery store says "Hawaiian style" so I bought that because it reminds me of my childhood in Hawaii. But you can get any kind of fried tofu. They're sometimes marked "smoked." They're a lot firmer than regular tofu, which makes it easier to handle in the wok. 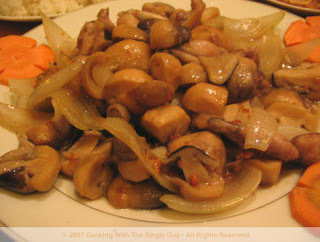 In the recipe below, I've combined it with Chinese long bean, another favorite ingredient of mines. First, because it's so interesting to see at the food counter with the deep-green color and long beans that make you want to weave it into a hair extension! But I'll resist the temptation and instead add it to the wok. And second, because it can keep up its firmness and adds a crunch to your dish. Enjoy! 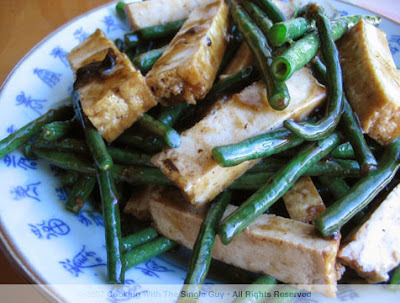 Add your tofu and blend well with beans and black bean sauce to warm up the tofu. (Careful not to stir too much or you’ll break your tofu into bits.) In a small bowl, mix your cornstarch and water to create a slurry to help thicken your sauce. Add this to your wok on high heat to thicken to your taste. Finish dish off with either oyster sauce or fish sauce blended in and then plate. Makes 2 to 3 servings. Serve with steamed jasmine rice. Serve with a glass of riesling. TIP: I give you a choice of oyster sauce or fish sauce so you can decide where your dish leans in flavor. Oyster sauce will give your dish a Chinese flavor while fish sauce will make it more Vietnamese or Thai. Either way, both are pretty salty so use it like you’re adding salt; taste as you do it to see if you’ve added enough. GIVE ME SOME HEAT: Another way to spice up this dish is to add one red chili to give it some heat. Be sure to seed the chili (unless you like it super hot) and then julienne it. Then add the same time you add the tofu. 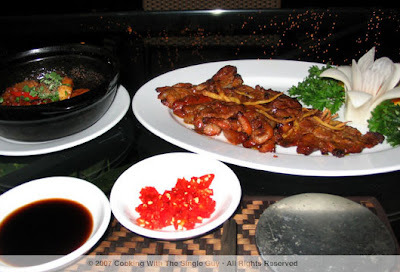 This is my 15th and last post about my food adventures in Saigon/Ho Chi Minh City in Vietnam. Yes, after two months of blogging, we come to my final meal in the city. If you want to catch up on my previous posts, just check my archives under the Travel labels. Final Meal—Time to Splurge! After nearly 10 days of spending just $5 to $7 for dinner, I decided to treat myself to a grand dining experience on my last night in Saigon/Ho Chi Minh City. I toyed with the idea of eating at a French restaurant because the French cooking style is reportedly still remarkable in this former French colony. But I scratched that idea when I thought of having to wear a tie or suit to dinner in my still very hot-and-humid state of being. 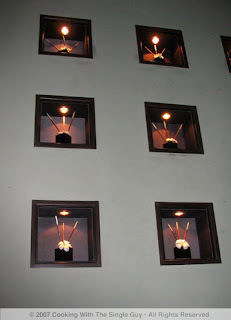 So that brought me to Nam Phan, this classic Vietnamese restaurant with a sophisticated flair. 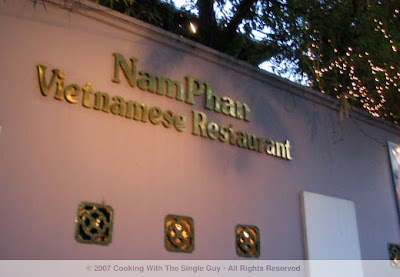 I’d read about Nam Phan prior to arriving in Saigon, and ran into it by accident one day while walking around the tourist area in District 1. The exterior is relatively simple—almost like a guarded wall to a secret garden inside—but you quickly see the restaurant’s name in lights and several large posters with beautifully photographed dishes. So I made a mental note and returned on my last night. I first walked into the courtyard filled with bamboo trees strung up with Christmas lights. I half expected to see a karaoke singer nearby. The hostess asked if I wanted to sit outside but I explained to her my 10 days of battling the humidity and asked for a table inside. Now seated outside with the city traffic honking out loud, I tried to transcend myself by focusing on the babbling man-made water pond nearby and focused on the menu. Just looking at the prices (ranging from D70,0000 to D235,000 or $4.35 to $14.60) made me fondly recap my previous dinners where all my meals cost about the price of one entrée at Nam Phan. Still, it was my final meal (and probably a good transition back to the reality of Bay Area pricing). So I ordered the Asparagus and Crab Meat Soup (D70,000 or $4.35), Stewed Bellyfish in Pineapple (D105,000 or $6.56) and Grilled Duck Breast with Orange Sauce. (I was ready to eat some poultry after spending my whole trip avoiding chicken or other poultry because of reports of another bird flu death nearby.) Turned out they were out of the duck in orange sauce so I ordered Grilled Duck Breast with Five Tastes (D130,000 or $8.15) as my backup. Then came my two main dishes. The fish came in a claypot (I don’t know why, but for some reason I pictured it coming out in a pineapple boat) and my grilled duck looked tempting fanned out on a platter. I got some steamed rice and was ready to eat. The fish was perfectly cook, like biting into soft pillows of sweet and sour goodness. Ironically, I didn’t see any bits of pineapple (after being disappointed that it wasn’t served in half a pineapple) despite the dish being called Stewed Bellyfish in Pineapple, or Ca Bong Lau Kho To. I guess it was just stewed in pineapple juice. My duck was tender but during the whole time I was eating the pieces, I kept thinking, am I eating beef? Did they confuse my order and thought I ordered beef when I wanted duck? The duck meat didn’t have that familiar slightly rear redness of duck or the dark coloring. It was tender and tasted like well-cooked Mongolian beef. And I didn’t taste a variety of spices to create the five tastes. I just had one taste, albeit a good one. It was filling but far from tantalizing. By the end of the meal, I was ready to leave with just a passing look at the dessert menu. 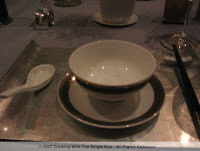 (They had the typical sweet soups, baked apple pie and crème caramel.) While the execution of the dishes was spot on, they hardly pushed the nouveau lines like the restaurant posters’ claimed. When my bill arrived, I was charged a service charge (5%) and some weird local tax (10%) that none of the other restaurants I ate in during my trip ever charged me. My total came out to D433,125 (or $27), easily the highest amount I paid for dinner for my entire trip. It's a decent tab for the United States but scandalous in Vietnam. I walked back to my hotel in the night and was jealous of all the diners sitting on plastic stools eating from street vendors. I didn’t get a chance to write about all my eating adventures in Saigon/HCMC. I stuck with mostly the high points. Below is a quick look at some of my other meals, some hits and some misses, that rounded out my Vietnam culinary experience. Singapore Fried Noodles at Kim Café, 270 De Tham, District 1 (near the so-called "backpackers district" because of the many youth hostels nearby). I ate at this café because it also has a travel agency right next door where I arranged my tour of the Mekong Delta. This place was like a dive, but the food was clean, hearty and cheap. 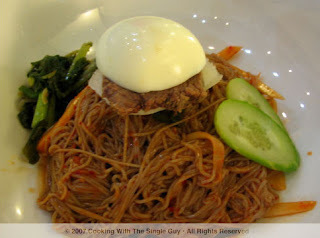 This noodle dish, of course, is not Vietnamese but a traditional Singaporean dish that I order often back home. 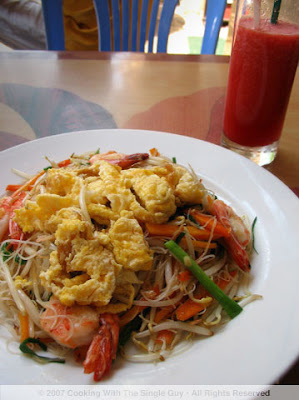 The base is thin vermicelli rice noodles and it’s often served with eggs and shrimp in a curry base. It was filling! Sauteed Frog Legs with Mushrooms at Phuong Nam in Can Tho. On my first night in the Mekong Delta, our tour guide took us to eat at this restaurant often recommended by tour guides. The food was mediocre and I was trying to find something unusual but the most exotic (other than the snake meat appetizers) was this dish of frog legs. While most of my fellow travelers (from Australia and Germany) thought I was weird, it was no biggie since I’ve eaten frog legs before in Paris, New York and the Bay Area. These were just OK, served up with simple button mushrooms. 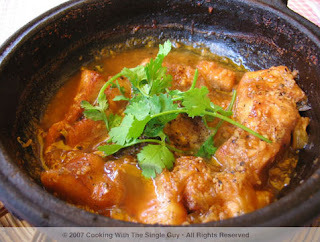 Ca Kho To or Boneless Fish in Clay Pot at Nam Bo in Can Tho. On our second day in Can Tho, our tour guide took us back to Phuong Nam to eat at the restaurant right next door. The owners are friends and they share similar items on the menu. However, the cooking technique at this restaurant next door is far superior. This claypot dish was so fresh, tasty and fluffy (is that a culinary description?) that it turned me on to claypot cooking, which I plan to make soon. 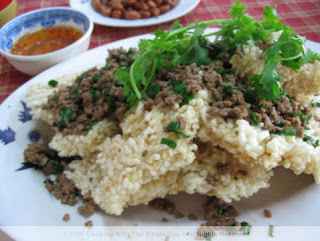 Meat With Burnt Rice at Nha Hang, 242 Tran Bing Trong, District 5. After walking in this area known as the Chinatown of Saigon and not finding one dim sum restaurant, I wandered into this local dive that looked pretty crowded with Vietnamese people having an afternoon drink. I saw on the menu this dish called Meat with Burnt Rice and wondered what it could be. Ugh, the horror. It was rice from the bottom of the rice pot that had been puffed up into what resembled rice crackers. (All you dieters know what I mean.) And then grounded meat was poured over the rice pieces. Probably my worst meal in Vietnam, but luckily, only one or two mishaps in what was generally a wonderful culinary experience. Is It Soup or Art?